As my wife had to attend a conference in Augsburg (about 1.5hrs away from here), I decided to take the opportunity to activate my first DM (German low mountains) summit (so far all had been DL (Alpine) ) and so “chalk up” another association. As the conference was to run for about 6 hours, I could pick a slightly higher scoring summit not close to Augsburg and I chose the 6 point Dürrenberg DM/BM-226 as it would be about another 1.5 Hrs drive north from Augsburg, giving me 1.5-2 hours on the summit before I had to return. Dürrenberg is also located within the Altmuhltal national park which for those interested in the WWFF award scheme has the DLFF code of DLFF-036. I hoped that if conditions were any good I might get that elusive VK short path contact and failing that at around the same time I was planning to be active, some summits in the USA were also being activated so I might nab an S2S into the US..
Dürrenberg is just outside of Heidenheim about 1.5 hours drive north of Augsburg. Max DK1MAX who was the last to activate this summit, kindly gave me some information about the final access. This is on an ex-military training area, so although public access is allowed, it’s on foot with a barrier blocking the access road. Fifteen minutes steady up hill walk from the public road is all that is required, so an “easy” summit to access. This was probably my worst activation in Germany, perhaps overall ! Not because of equipment problems or band conditions (they weren’t great with weak signals and very, very deep QSB) but rather navigation to the site. I currently do not have a “navi”/GPS and so was relying upon a printout of the planned route from Google maps. Who would have thought there would be two IDENTICALLY NAMED towns both on the same main road – the 466! Add to this the point where I had to turn onto this road was a town called Nordlingen where Haidenheim was already signposted. Great I thought, I’ll simply follow the road signs now rather than trying to read the notes while driving. Of course, as luck would have it, the Haidenheim that was signposted was the WRONG ONE. 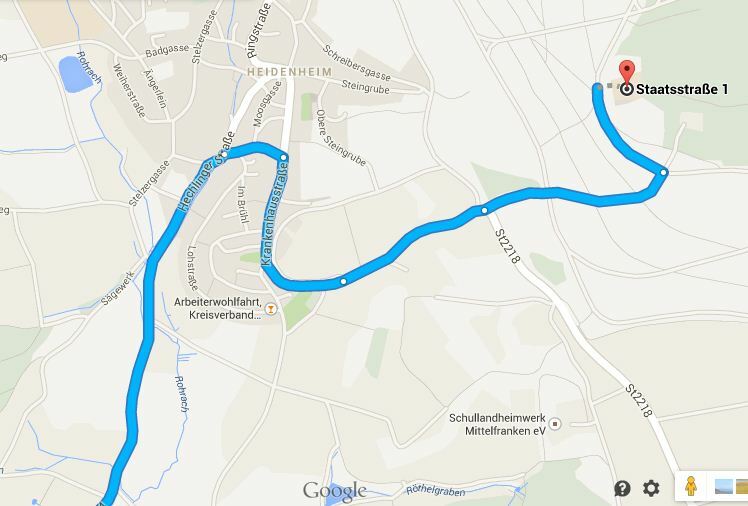 I should have realised that so far away from the small Heidenheim village, it would not be already signposted. I diligently followed the signs and only when I got to the signposted Heidenheim did I smell a rat as I could not find the roads that I expected to have to follow and this was a TOWN not a VILLAGE. Once I checked my location using the maps program on my smart phone, I saw it saying I was probably nearly 100km away from the location I wanted to be at and this was quickly approaching my alerted start time. I had two choices, to try to get to the correct Heidenheim and then up to Dürrenberg and have a very short activation before hi-tailing it back to Augsburg or cancel the activation. I decided on the former and after getting lost in Nordlingen because of incorrect signage in the town twice, I eventually found the 466 road in the correct direction out of town. So after about four hours driving for what should have been 1.5 hours I arrived at Dürrenberg at about 15:50 local time. After setting up, spotting and calling for what seemed like an age, I got a call from Mike, G6TUH in England followed by Jorge EA2LU and Manual EA2DT from Spain and then nothing! I tried 2m FM – no response (not surprising as I only had the HT and it’s rubber-duck style antenna).. I still needed one more contact to be able to claim the activation and it was already time that I should be packing up to head back to Augsburg. I switched to 40m and luckily picked up two stations from the Slovak Republic Martin OM5DP and Vlado OM1AX, which made 5 contacts from the summit. One last call – no takers, so I packed up and headed back down the hill to the car and back to Augsburg to pick up my wife about 15 minutes later than originally planned. By the time we arrived home, I have been traveling for over 6 hours and as the Ozzies say “I was bushed”. To prove I was there, I also took some photos. The support for the squid pole that you can see is an air vent, possibly from some underground bunker on the site:. FT817ND (running barefoot this time).. Always double check a route. Do not rely on roadsigns. Ideally have a navigator – either a person or a machine to double check the route you are driving. Late afternoon is currently not a good time for HF QRP QSOs from summits in Europe. This entry was posted in SOTA and tagged Dürrenberg, DM/BM-226, SOTA by VK2JI DD5LP G8GLM. Bookmark the permalink.